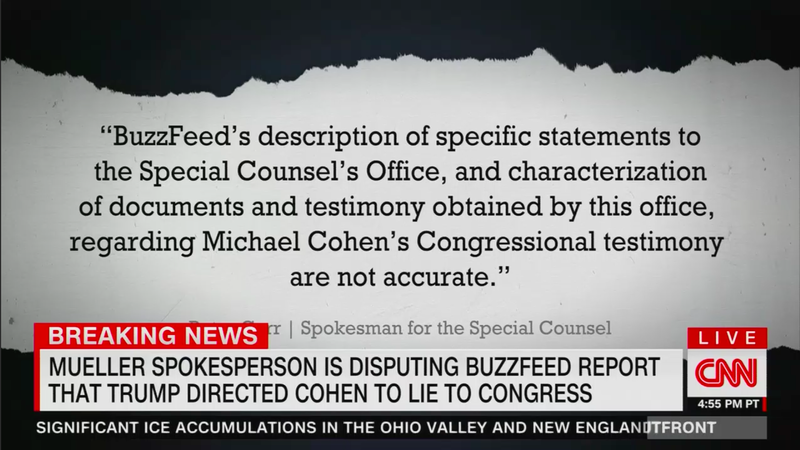 The NY Times got similar guidance: "One person familiar with Mr. Cohen’s testimony to the special counsel’s prosecutors said that Mr. Cohen did not state that the president had pressured him to lie to Congress." And this morning: "Many people are saying that the Mainstream Media will have a very hard time restoring credibility because of the way they have treated me over the past 3 years (including the election lead-up)." Relevant emails could become public, and other outlets could find more on this — who knows. "How can you stand fully behind your reporting when Mueller says it's at least partly wrong?" "We literally don't know what the special counsel is referring to." "Should someone lose their job if you or the reporters were wrong in accusing the president of a felony?" "And I'm not going to speculate."